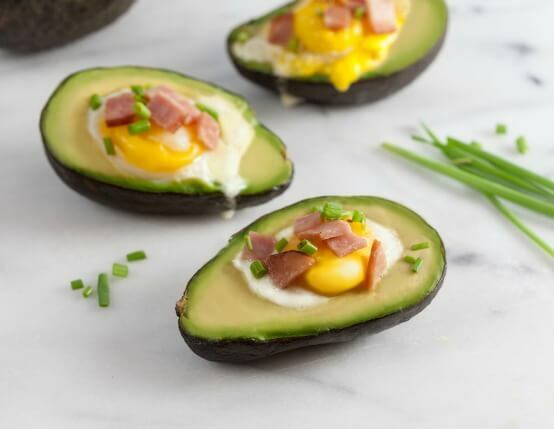 Whether you eat them with a spoon or spread them on gluten-free toast, you can't go wrong with these protein-packed, Canadian Bacon filled avocados. Heat oil in small skillet. Add Canadian bacon and cook 2-3 minutes, or until golden brown and crisp on edges. Remove from heat and dice. Split avocados and remove pits. Use a spoon to carefully scoop about 2 teaspoons from each avocado half to make holes bigger. Place avocados on baking sheet. Divide half Canadian bacon between avocados. Crack an egg into each avocado. Bake for 15 minutes, or until eggs are cooked. Remove from oven and top with remaining Canadian bacon and chopped chives. Serve with spoon or scoop onto toasted gluten-free bread. Tip: For a neater presentation, separate eggs. Place yolk into avocados first, then add as much of the white that will fit (there may be some left over).